Well we have finally reached 100 of these posts and it’s been a surprise somewhat that I’ve been able to keep this going as long as it has. I guess I have a large collection to draw upon (and still plenty more that I haven’t discussed so onwards and upwards to 200). 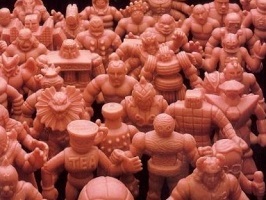 This week I’m going to discuss the M.U.S.C.L.E. 28-packs and what they mean to me. It started with my childhood collecting various 4- and 10-packs and the many figures they possessed. I had already a bunch of flesh and colored figures in my collection. All of them procured from department stores in Brisbane, Australia such as K-Mart, Big W, Target and Franklins. I very rarely ventured in Myer as it’s not a store known for its toy department. 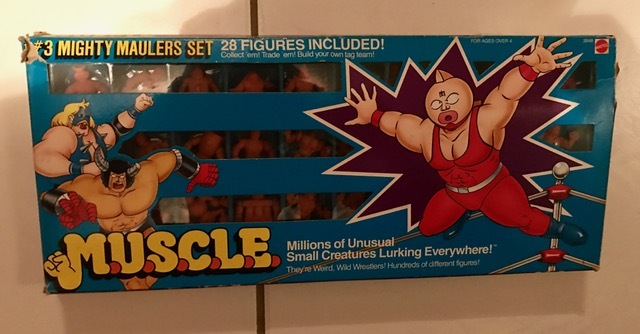 I was in there with my mother in mid- to late 1987 and spotted something in their small toy department I’d never seen before – M.U.S.C.L.E. 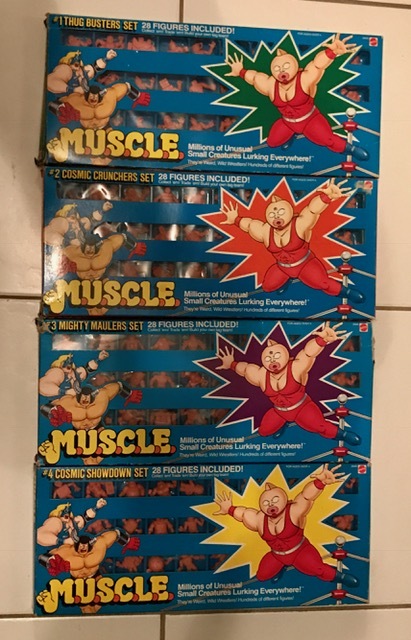 packs that were long and flat and contained 28 figures! To say I was surprised is a massive understatement. I couldn’t believe it! Even though I’d moved on to colored figures and the packs I saw that day were Flesh only figures, these packs had 28 unique figures and I had to have them. I begged my mother to buy one of them – there were three there and I got pack #4 purely because of two figures I saw in it. The Announcer and The Mari. Those two stood out to me. My memory of the price of the 28-packs is hazy but I remember my mother complaining about the cost. I’m pretty sure they were $20 but I could be wrong. I got one of the other 28-packs for Christmas that year – again all Flesh and I’m certain from the same store. They mustn’t have sold well as I’m certain I went back there when I had enough money and bought their third 28-pack. So I now owned packs one, two, and four. The funny thing is I never saw pack #3 but I did find a single figure from that 28-pack in that Myer store on the floor and so I picked it up and kept it. That was a flesh #87 who I named “Headless.” I think I can safely say that particular store ordered four of the 28-packs and I ended with three of them plus one figure. The poor bugger who got the other pack must have been disappointed when he saw only 27 figures in his pack. What’s a mystery to me is that I never ever saw another 28-pack again in any store I went to, none of my regular ones and no other Myer stores. It was very unusual. I wanted that #3 pack badly. I didn’t know until I started collecting as an adult that the 28-packs were available in color. It’s probably why the set of 28-packs I own are all flesh – it’s how I remember them. I do own all four packs but I need to upgrade my #3 pack. It was the first one I bought when I started as an adult collector seeing I never had it. Discovering all those new figures was a very cool experience. But because I wanted it fast I bought one in poor condition. There is a tear in the side of the box and damage to the window on the front and it does look ordinary. It is the only one of my 28-packs that doesn’t have the poster offer on the back though. That poster is another M.U.S.C.L.E. mystery for another day. Amazingly I don’t actually see many 28-packs up for auction. I wonder why that is? Maybe it’s because they weren’t sealed and therefore people didn’t keep the boxes as readily as the sealed 4- and 10-packs? I’d be interested in hearing some theories. 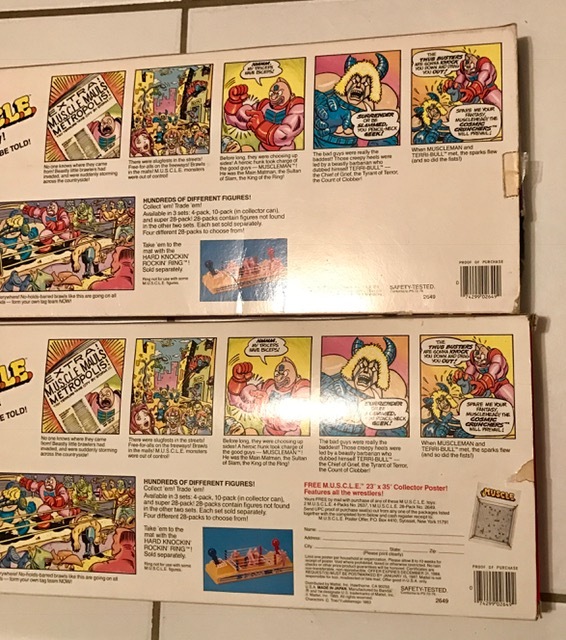 Even though #4 was the first 28-pack I ever owned, my favorite now though would be #1 – it has a good mix of figures that I like whereas #4 still has the two figures I originally picked it for. This entry was posted on Monday, April 24th, 2017 and is filed under UofM News. You can follow any responses to this entry through RSS 2.0. You can skip to the end and leave a response. Pinging is currently not allowed.